The creation of this photo took many steps, so I decided to split the process into two videos across two Sundays for Passport Members. So, today, we get to see the resolution to our exciting cliffhanger! Here is a Link to Part 1 of this video from last Sunday if you did not see it. In this one, you’ll see how I put the finishing touches on this challenging pano with Aurora HDR. This is actually another panorama, but it was a little easier to put together. I was lucky enough to go out and get really close to the space shuttle on the day before the big launch. I was so excited… just a like a little kid! I still get excited thinking about it. If you’re a Passport member, today you’ll see how I’ve changed the way I stitch together my panoramas, especially for these shots that are made from the drone. Creating this photo took quite a while, so I decided to split it up into two videos! In this first one, you’ll see how I prep the photos before I make the panorama and then the final stitching process. In the next video (next Sunday), I’ll show how I use Aurora HDR for the final touches. It was a perfect day a few weeks ago on the drive back, so I got the new Mavic 2 Zoom up in the air to take this panorama. It’s kind of annoying, in a way, that when the Mavic zooms into the sky, it doesn’t do any exposure adjustment. That always requires a little bit of cleanup. 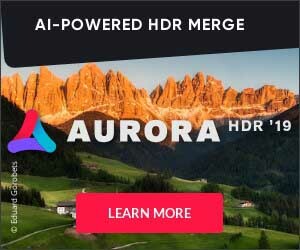 Hey guys, don’t forget to pop over to our store and get the new Aurora HDR 2019. Today’s photo is a good example of what it can make out of a single RAW file (handheld shot). One of the New Zealand TV Morning Shows invited me down for an interview early one morning here in Queenstown. They were set up down by the lake, and it was freezing cold. I don’t know why they decided to do it at the coldest time of year, but, hey, I’m not in TV production. Anyway, I went down there to give a little interview about my fine art and some of my collectors. About 30 seconds before I ran onto the set, I took this photo! I added this to the Flickr forums after they announced the new pricing model at Flickr. I’ll share it with you now! Oh, also, here’s a link to my Flickr Account. I think all the Pro features look fantastic and it’s a huge step in the right direction. I know the team is very serious about doing this the right way. Besides, the cost of Pro is a FRACTION of what most photographers pay for their equipment. And let’s face it, the equipment is not nearly as fun as Flickr and sharing photos. So why don’t more people look at the fun:money ratio? Anyway, I’m going for the new Pro option and so are all my photographer friends I’ve polled. It’s a heck of a deal… I’m not even sure where else you can get unlimited storage for full-rez files for that price. And, when you think about it, that price really is extremely small compared to your camera/phone + lenses + apps + travel, etc. If you like the online service, why not pay for it? I read someone above talking about when art meets money things get messy. That can be true, but it’s always been a bit messy with the production and distribution of art ala movies, tv, music, etc. We see new smarter models all the time like Netflix and Spotify. They are much more efficient mechanisms (with no ads yay!) for the distribution of art than previous iterations. On the corporate side, they have a predictable income every month so they can make better planning decisions when it comes to adding new features and expansion. I don’t know if you listen to the Sam Harris podcast or not, but he uses this same monthly model and his fans love it. Anyway, I’m excited to pay for the features and the fun. Flickr has done so much for me over the past TWELVE (whoa I just had to look that up) years. They are committed to making it even better, so I’m more than happy to keep my Pro account. These guys are pretty easy to spot, I tell ya. And not because they happened to be near a Chinese couple in wedding garb. Wedding couples seem to ALWAYS bring their own photographer from China. And, since the couple are so over-the-top in their outfits, the photographers have started to assume all manners of dress as well. Some are all-Banksy like this guy and others wear shiny three-piece suits.